Candace Steven is a striking young woman, the picture of health and well-being. Tall, full figured, blooming skin, long silky naturally blonde hair, pixie lips always on the verge of a smile and sparkling eyes that look at you candidly. And she is candid, as well as articulate. As we talk, she rocking her baby son, Koen, I am impressed at how this young mother understands herself and holds a clear vision of what she wants of life. 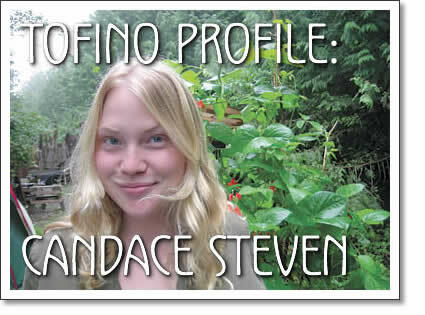 Tofino born and bred, Candace grew up in the 80s, with the village freedom characteristic of that time, safe within the watchful eyes of the community, neighbors and friends who functioned like a huge extended family. Among her special playmates, Willa Bradshaw, Leslie Hansen and Trina Sloman. Growing up in Tofino provided many benefits, beginning with the freedom, surrounded by the splendour of our natural environment, and in contact with people from all over the world who provided knowledge and worldliness. We chat awhile about the difficulty of finding affordable places to buy in Tofino. Naturally, Candace and John want to purchase a home; they want to stop playing “musical homes” as Candace puts it. I ask her if she will stay in Tofino no matter what, now that she has a family. She answers by telling me a short story. We wish you good fortune Candace. May your dreams for your little family come true.